I’ve been fortunate to work for and with extremely bright and talented individuals above and below the line; clients, architects, designers, contractors, journeymen and tradesmen alike. It has been my honor and privilege to have gained the trust of both classes in my trade such that I have been given, not necessarily free reign but tacit freedom to direct, explore and venture into processes, materials, details and finishes that were never delineated on any set of plans or spec sheets and to express those journeys in the final representation of our collaborative efforts. To those individuals whose trust I have earned to sail into uncharted waters at their professional and financial expense and risk, I am eternally thankful. 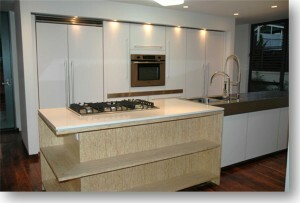 This entry was posted in rad one_designs and tagged Custom Kitchen, Modern Kitchen, New Kitchen. Bookmark the permalink.